So to distract myself from the dissmal reality of the backyard I decided to make some seed starting pots. From newspapers no less. I am on a budget as it were, and it never hurts to recycle a bit. If you've never done it I have posted pictures and instructions below. Follow along and save some money and some trees! 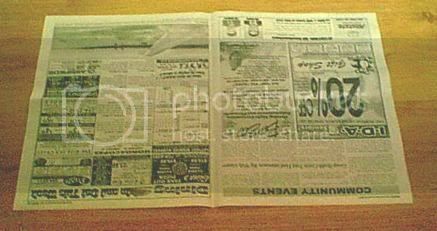 To start you will need a single sheet of newspaper. I am using one that is from a little local press, it is somewhat smaller than average, but you can use whatever you like. Lay it out lengthwise, like in the photo below. Then fold it once more to get a nice long strip that is several layers thick. See the photo below. Now you need a can. I am using a 5.5 ounce/156 ml tomato paste can. This type of can makes a fairly average sized seed planting pot. You can make bigger pots by using larger cans. Condensed soup cans also work well. 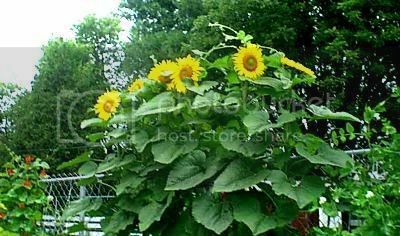 You may want to use two sheets of newspaper for larger pots. You might also need to adjust the width of the strip for the larger sized container. Now take your can and lay it on the strip of paper, but leave enough of an overhang that you can fold the paper accross the bottom of the can and seal it up. This will form the bottom of the can. 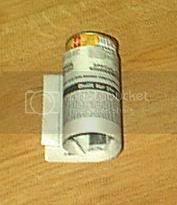 Now fold in the paper around the bottom of the can. To really set the creases, place the can on a hard surface, press down fairly hard and twist or rub it back and forth. To seal the edge, use a small strip of tape on the seam near the top of the pot. 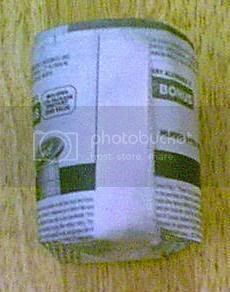 The bottom of the pot will look like the photo below, use a small strip or two, of tape to secure it. Slip the can out after you have taped the side seam and bottom flaps in place. Ta Da! You're done and your seed planting pot should look like the one in our last photo. Quick, easy and ecconomical. Your pot is now ready to fill with soil and plant as normal. Set the pots close together in a tray and treat as you would peat pots. Yes they will hold up just fine. 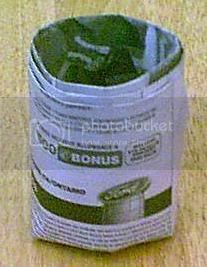 When planting time comes you can pop the whole pot right in your planting hole, the newspaper will break down in the soil. You can remove the tape from the bottom, open it up and cut away the excess with garden shears, if you like. This will give the plant roots easy access to the soil. Things will be back to normality soon enough Joy, just keep repeating to yourself "Spring is near, spring is near". I agree the snow isn't much to look at, a sea of white nothingness most times. Isn't that something? I'm walking about the gardens almost in tears. SO much work. We had a nasty ice storm, so we have TONS of trees, limbs, sticks and a giant mess to clean up. 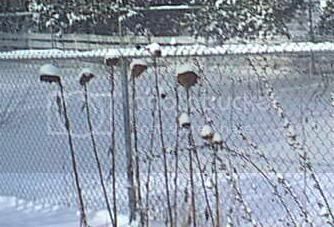 And to think at this time of year I'm usually fine tuning things for spring. Keep your chin up and I'll do the same. Spring will be here before you know it. Try to keep busy by looking at seed catalogs, gardening books, or go buy the newest edition of your favorite gardening magazine. I've been looking at the new ones at work and they cheer me up. Great idea Joy, I have seen these before but didn't realize how easy there are to make. Thanks for the info. What a great idea! When did you take the can out? Thanks for those directions Joy! I usually save little yogurt containers or whatever I can get my hands on, but I think I'd sooner plant in those and put the whole thing in the ground. 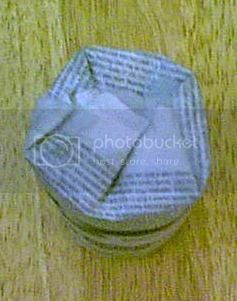 I've been making square newspaper pots for a while now - maybe I'll try some of your round ones for a change. They're really great because you don't have to disturb your seedlings when you plant them out into the garden. and carry us through to the spring. I'll have to try those they look great and so easy to plant the whole thing.